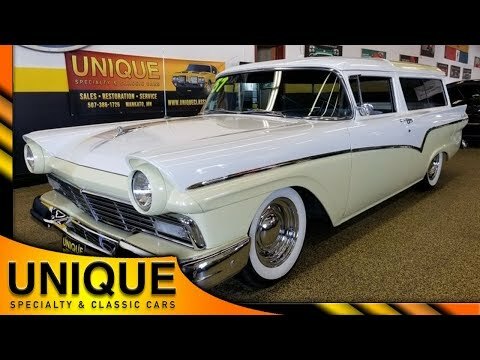 1957 Ford Fairlane Ranch Wagon 2dr Street Rod, must see! TRADES? 1957 Ford Fairlane 2dr Ranch Wagon a very cool looking car. Paint is in nice condition and has a nice luster. Powered by a 390 Ford paired with a 4-speed transmission. Has a great stance to it, new rear shocks, Ford 9" rear end as well. Brightwork and bumpers are in very nice shape. Interior has been redone in a cloth/vinyl combination. Doorcards match the interior and are also in great condition. Black and gray bench seats. Seatbelts added to the front and rear. Headliner in good shape. Later model gauges added including an aftermarket Tach. Aftermarket stereo. 4 speed on the floor.